PROFESSIONALLY AND PERSONALLY, my first title, Dual Ring Dog, was a break-though. AS YOU CAN SEE from the overview above, the topic hadn’t been addressed before. My co-author, Jackie Fraser, and I approached it with equal passion from entirely divergent directions. Thanks to Jackie, the content is focused, surprizingly enjoyable to read considering it’s a ‘how-to’ manual and really easy to apply. ABOUT 6 MONTHS LATER, long after either of us remembered submitting a proposal, we received a contract for Dual Ring Dog. The initial excitement mutated into panic. Separated by 300 miles, we used the technology of the day (a telephone, typewriter, and US mail delivery) to keep the project on track. The best perk for me was being able to talk to Jackie for hours, several times a week. Our other relationships didn’t fare as well — we both divorced before the book was released. On a brighter note, my subequent co-authors have remained married. THOUGH AUTHORS USED TO GET better treatment from publishers than they do today, fatal errors were committed when this title was published in 1991. The cover is hideous, my name is incorrect in the Library of Congress listing, and the book was mis-categorized — and we were powerless to change any of it. Perhaps the publisher was arrogant, apathetic or both and the book was only in print for a few years. Used copies are still available so grab one if you can. PHOTOS INCLUDE working sessions with American Staffordshire terriers, Japanese Chin, Aussie, dobermans and more. THIS IS AN OLDER BOOK, “pre-clicker”, and so has a more traditional approach. But the methods are not harsh. There are two authors, one a breeder of Am Staffs, who prefers the conformation ring but also does obedience, the other primarily a performance person who also does conformation. They explain early on, that they will each offer their own perspective. EACH AKC OBEDIENCE EXERCISE, novice through utility is explained, and a method of training it is offered. Then, for each exercise, they provide a couple of lists. One is a list of what is the responsibility of the handler, another is what is the reasonability of the dog, and then a list of common errors is offered, with suggestions on how to deal with this. THEY ALSO EXPLAIN the minimum you have to do to pass the exercise, if you are just doing something with your conformation dog, and basic titles are your goal, rather than a perfect 200. IT HAS SOME GOOD IDEAS, and is a good addition to your toolbox. 5.0 OUT OF 5 STARS: Excellent instructional book! WE FOUND THIS BOOK (although now out of print) TO BE INFORMATIVE, and containing excellent tips on training your dog for competition. The illustrations are excellent, and a real source of entertainment for the reader. 5.0 OUT OF 5 STARS: Great, practical book with methods that WORK! I’VE TRAINED MANY, MANY DOGS using the methods described in this book with great results. The methods are not ‘purely positive’ or ‘clicker training’ but they really work, dogs enjoy learning with these methods, they learn quickly, and the occasional correction is done so the dog thinks he’s correcting himself for an error, and does not see the handler as the source of correction. There are no ‘harsh’ or ‘cruel’ corrections, so don’t get the wrong impression. Best of all, the methods work great even if you don’t have a ‘typical obedience breed’ like a Sheltie or Golden. THERE ARE STILL PEOPLE who’ll tell you your dog can’t excel in both the conformation and obedience rings. It’s hogwash and these authors prove it. 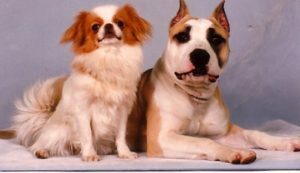 Both have dual ring champions and Amy Ammen is especially known for her dual ring successes in breeds as diverse as the American Staffordshire Terrier and the Japanese Chin.